This route traverses five peaks along a ridgecrest, and is mostly hiking and scrambling. It is not a particularly hard via ferrata - although it does have one good steep and airy section. The ferrata is located in the 'piccoli dolomiti' region (more specifically, the Pasubio range), and as such it is lower and warmer. 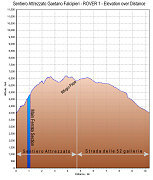 The route is described as a loop, with the first half of the loop being the ferrata, and the second half (the return half) being a walk along a very neat historic world-war-I mountain road called the 'strada delle 52 gallerie' (or, 'road of the 52 tunnels'). Even though it is less than 11km in total, distance-wise, the whole outing is fairly long and strenuous. The route starts at the Bocchetta di Campiglia, a quiet and out-of-the-way pass. It is reached via a twisty mountain road through the rural and mountainous area southwest of Rovereto. A superbly paved and twisty road (the S46) leads southeast from Rovereto. The road climbs and crosses over the passo Pian delle Fugazze. Shortly after the pass (within a kilometre or two), a small side road leadings up towards the Bocchetta di Campiglia and the Strada delle 52 gallerie. Only about a lane and a half wide, the road winds through dense forest, traversing along a slope, and leads up towards a spot called Colle Xomo, where at a junction a road heads up left. Taking this road, you shortly arrive at the pass (i.e. the Bocchetta di Campiglia) and a large parking area. The large parking area is there primarily because of the Strada delle 52 gallerie (which is the return route for this itinerary). On the north side of the parking lot you'll find the brown sign marking the start of the 'sentiero attrezzato'. Follow this, and not the grandiose entrypoint for the strada delle 52 gallerie. The route quickly enters forest and climbs steeply up an earthy, switchbacking trail. It isn't long before you reach a memorial plaque and a few easy rock outcrops, some of which have a bit of ferrata wire. Views start to open up over verdant valleys and forested slopes, and of the craggy ridgeline that you are following. The route continues on the ridgecrest, with a few outcrops here and there to be climbed, but nothing hard. You'll also get occasional views down to your left to the winding route of the Strada delle 52 Gallerie - your return route. In a few places, the ferrata route comes down into a col such that you can take a short side path left down onto the strada, if desired. However, only do this if you want to shortcut your route, as you'll be coming back down the strada later on, anyway. The route continues up the ridge, again with bits of easy scrambling / ferrata, and a lot of nice, switchbacking path, in and out of trees, and up steep grassy ravines. Eventually large craggy outcrops and a big wall obstructs passage further along the ridge (without climbing, that is). The ferrata starts in earnest now, climbing up over these crags and up a nearly vertical, long ladder. This is the meat of the ferrata, and it is most strenuous part of the route (climbing-wise). Above the ladder, there is a nice airy horizontal traverse around the face of the wall, and then the trail resumes. There is nothing harder (ferrata-wise) than this section. Once above this climbing section, the route again returns to pleasant, mostly ridge-top hiking. The route is now mostly above treeline, and there are excellent views in all directions. There is one very nice view of the strada as one nears the summit of Cima Bella Laita. Traversing and scrambling along, it isn't long before the summit of Cima Cuaro is reached. From here, you can see much of the next part of the route, which dips a long way down into Forcella Camosara before climbing all the way back up again to Cima Forni Alti. It is about a 400 to 500 foot descent down into the col and back up again. The backside of Cima Cuaro is steep, and there is ferrata, but it is relatively easy downclimbing on good rock. After crossing the Forcella, the route immediately starts climbing some nice, square, blocky rock as it heads up the ridge to Cima Forni Alti. It is up on the top of Cima Forni Alti that you start encountering wartime ruins. There are tunnels, stoneworks, old wood, and barbed wire. From Cima Forni Alti's summit, the route then descends into another col, this one called 'Passo Fontana d'Oro'. As you descend into this pass, you can see how the Strada delle 52 Gallerie and the ridgeline come very close together. The descent down into the col has a bit of climbing, but is mostly nicely descending trail.